The latest versions of Photoshop Elements and Premiere Elements are with us and each includes several new interesting - if not revelatory - enhancements. These versions include more automation than ever so the legwork is taken out of most basic editing processes as well as general organisation of your photos. There are also plenty more Guided Edits so it's easier to do more with your photos without in-depth knowledge. Touch Enabled – Organizer and Quick Edit mode are now touch friendly so that you can simply tap to do all your finding, sorting, and quick enhancements. Enhanced Search – Finding the right photo and video is always a challenge and Elements 15 makes it easier. Now you can find the exact photos and videos you're looking for by searching on a combination of things, including places, events, and other favorite subjects. Smart Tags – Elements now automatically tags your photos based on subjects like sunsets birthday, dogs, cats and more. Enhanced Instant Fix – there's easier instant fix so you can quickly and easily edit a batch of photos at one time. New Guided Edits – Guided Edits transform complex tasks into easy to follow step-by-step instructions. Photoshop Elements now offers 45 Guided Edits, including five brand new ones in this release. Photo Text - Now you can easily transform any photo into cool visual text and add an embossed look and drop shadows to really make it pop. It's great for anyone creating collages, scrapbook pages, cards, signs, and more. Painterly - Convert your photos into unique works of art. Painterly teaches you how to paint an effect over your subject and then add textures and colour themes. Effects Collage - Add multiple effects to a single photo. Tap into multiple templates and themes to choose one that suits your style. Speed Pan - Don't know how to or weren't able to catch the perfect speed-pan action shot? No problem. This new guided edit adds a motion blur behind your subject to create the dramatic effect. Frame Creator - A new way to create your own custom frames to complement your favorite photos and they can be added to the existing frame library. Adjust Facial Features–. Turn frowns upside down, adjust squinting eyes, and make other quick tweaks. Enhanced Filter Gallery– Choose the best filter for your photo and fine-tune the details. Layer Adjustment Guided Edit – This new Guided Edit makes it easy to give your movie a signature look by applying effects across multiple clips or your entire movie at once. Haze Removal – Users loved it in Photoshop Elements so now it's in Premiere Elements. 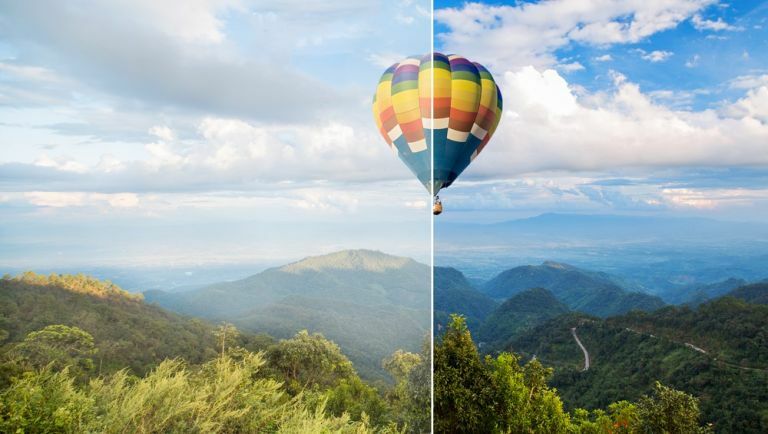 Haze Removal enables you to easily remove haze to make the background of your scenes as crisp as what's up front. Remix – Elimiates the frustration of matching different length music files with your video clips. Pick any music file, and it can be easily remixed to match the length of your movie with a natural sound and transition so you never lose the soul of your audio. Face Detection – Face detection is now available in Smart Trim, Favorite Moments and Pan and Zoom, giving priority to footage of what matters most – the people in your videos – when suggesting places to trim. With face detection, you'll get a great movie of friends and family without that unnecessary footage.